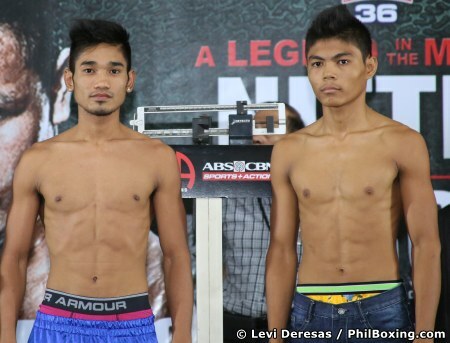 Check out the results and photos of Pinoy Pride 36: Legend in the Making headlined by the WBO junior flyweight champion Donnie "Ahas" Nietes vs the former IBF minimum weight champion Raul Rayito Garcia. Donnie Nietes - 108 lbs vs Raul Garcia - 108 lbs. for 12 rounds WBO Asia-Pacific bantamweight championship Arthur Villanueva, Philippines - 117.5 lbs vs Juan Jimenez, Mexico - 118 lbs. 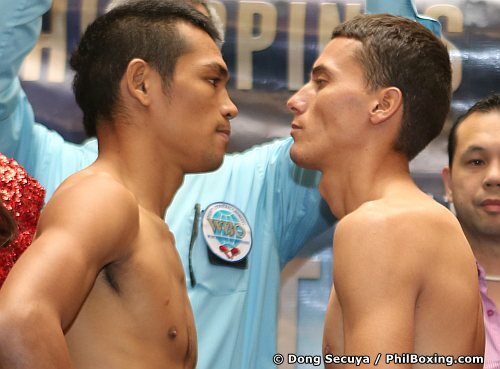 for 10 rounds junior flyweight Milan Melindo, Philippines -114.75 lbs vs Maximino Flores, Mexico - 110 lbs. Melindo was 4 lbs overweight from the junior flyweight division. for 8 rounds non-title junior flyweight fight Kevin Cataraja, Philippines - 112 lbs vs Chatchai Or Benjamas, Thailand - 112 lbs. for 12 rounds Philippine super flyweight championship Jonas Sultan, Zamboanga del Norte - 114.5 lbs vs Rommel Oliveros, Paranaque City - 115 lbs. for 8 rounds super flyweight bout Raul Yu, Butuan City - 114 lbs vs Robert Ates, Bacolod City - 115 lbs. for 6 rounds non-title flyweight fight Kenneth Gentallan, Tagbilaran City - 111 lbs vs Lenmar Prescillas, Mandaue City - 111 lbs. for rounds flyweight nontitle fight Gerard Suico, Mandaue City - 111 lbs vs Reymund Rama, Mandaue City - 112 lbs. You can watch the late telecast of Pinoy Pride 36 on ABS-CBN channel 2 on May 29, 2016, at 10:15 AM.